The previous update (What is a Tier 1 Environmental Impact Statement) discussed the importance of identifying alternatives that meet the Purpose and Need of the project. The identification and analysis of alternatives are key to the process required under the National Environmental Policy Act (or NEPA). In addition to the proposed Build Corridor Alternatives, all NEPA studies must include a No Build Alternative. The No Build Alternative represents the “do nothing” option or status quo, and is used as a baseline comparison and a viable option. So, what does that mean and how does it relate to the process, which is illustrated below? A Build Corridor Alternative is an area of land where an I-11 high-capacity transportation facility would be constructed to connect Nogales to US 93 north of Wickenburg. The Build Alternative may include construction of a new corridor, modification of existing corridors, or a combination of both. Modifications to an existing corridor could include a variety of improvements, such as adding travel lanes, adding interchanges or changing the access (e.g., upgrading a highway to a freeway by discontinuing access to and from driveways and side streets). Since this is a Tier 1 EIS, decisions will not be made regarding specific roadway features or improvements. Rather, each Build Corridor Alternative is a 2,000-foot-wide area within which the I-11 facility could be built. (A facility would approximately 400 feet and would be specifically determined through Tier 2 studies.) The outcome of the Tier 1 EIS will be to select a Build Corridor Alternative to advance to subsequent studies, or to select the No Build Alternative. Specific project activities and improvements needed to build a facility would be further evaluated once funding is identified in a future, more detailed and more specific NEPA environmental document. The No Build Alternative means the proposed action – the implementation of the I-11 corridor - would not take place. For the I-11 Tier 1 EIS, it is the alternative in which no improvements related to the I-11 corridor would occur and the transportation system would remain “as is,” with the exception of improvements currently planned and funded in the State Transportation Improvement Program. The No Build Alternative is used as a baseline comparison, or a benchmark, to compare against the Build Corridor Alternatives. It is used to understand the condition of the Study Area in the future with no proposed action, and also to understand how a Build Corridor Alternative could influence the Study Area – for better or worse. Depending on the outcome of the I-11 Tier 1 EIS analysis, the No Build Alternative could be the most viable or acceptable solution and recommendation. How do the alternatives relate to the Tier 1 EIS process? The Tier 1 EIS will assess the Build Corridor Alternatives and the No Build Alternative to consider a wide range of potential impacts. 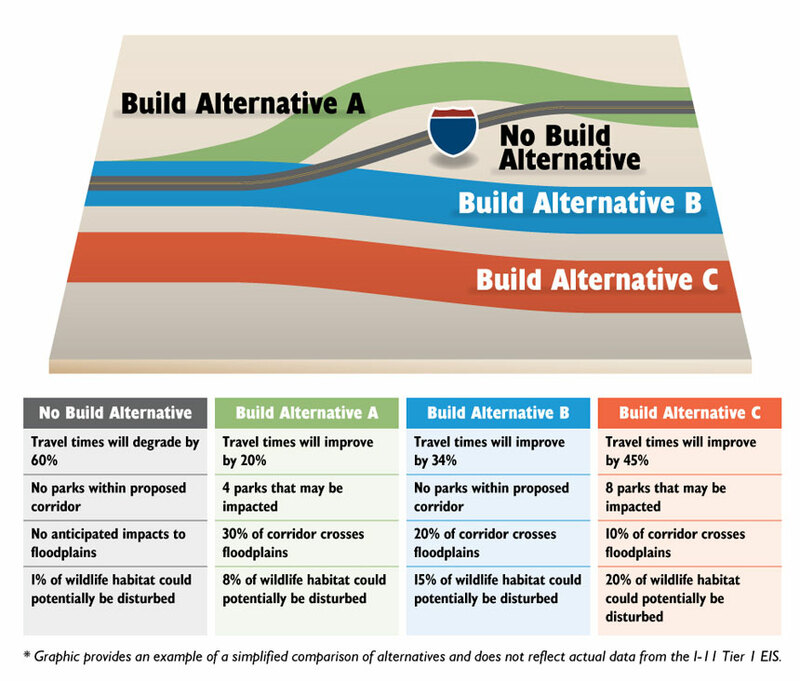 For example, the Build Corridor Alternatives and the No Build Alternative will be studied in the Tier 1 EIS to characterize how they compare in meeting the transportation purposes of the project, such as improving travel times, and what potential environmental effects could occur with implementation of each of the Build Corridor Alternatives. The following graphic shows an example of a simple comparison of alternatives. Note: This graphic is being used only for illustrative purposes and is not based on actual evaluation criteria or data. 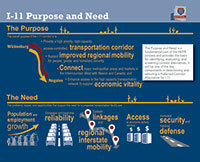 The graphic illustrates an existing interstate facility, three Build Corridor Alternatives, which include a combination of new corridors and their co-location with an existing facility, and a No Build Alternative. 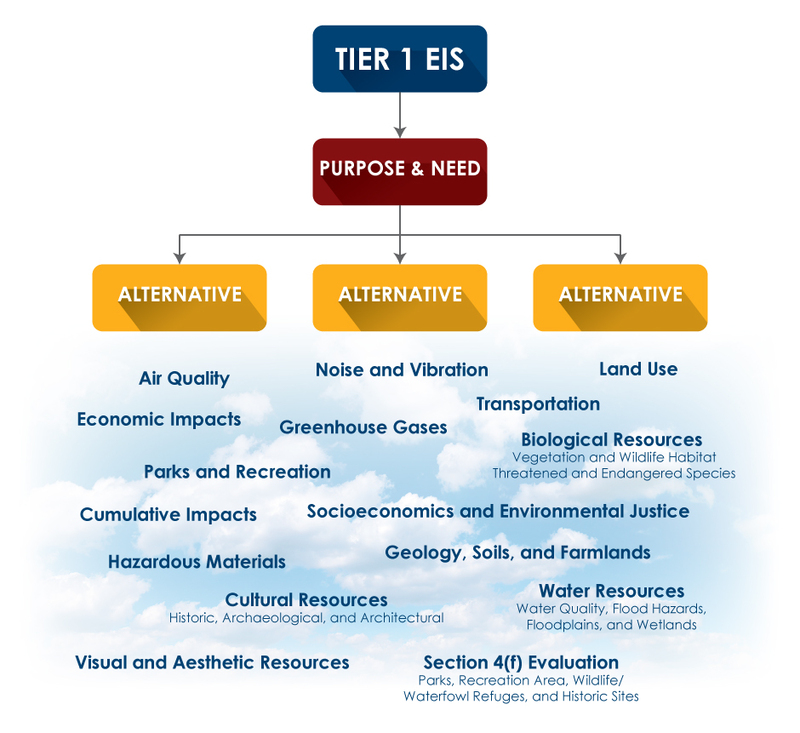 Generic evaluation measures show how potential environmental impacts may differ among alternatives and the types of considerations to expect in the Tier 1 EIS process. For more information on how the current Build Corridor Alternatives were selected and advanced into the I-11 Tier 1 EIS for further evaluation, please see the Alternatives Selection Report at http://i11study.com/Arizona/Documents.asp. What Issues Are Considered in an EIS? An Environmental Impact Statement, or an EIS, is a type of assessment required by the National Environmental Policy Act (NEPA) for federally funded or regulated projects. Of the different types of documentation, an EIS is considered the most thorough and considers all possible impacts of a proposed project –positive and negative – for many different resources. An EIS requires a Purpose and Need statement, which outlines why the project is needed and what the project hopes to achieve. From here, the study team identifies various options for the Interstate 11 (I-11) Corridor (referred to as corridor alternatives) that meet this Purpose and Need. Information is gathered and analyzed for all alternatives, including a No Build alternative (or, a “do-nothing” alternative) to determine which alternative best meets the project’s Purpose and Need while causing the least negative impacts on the built and natural environments. When adverse impacts are predicted, the EIS would identify strategies to avoid, minimize, or mitigate impacts. Major resource areas analyzed are shown in the figure. If you would like to be included on the I-11 mailing list to receive notifications of upcoming involvement activities and meetings, please notify us at I-11ADOTStudy@hdrinc.com or subscribe for updates via the study website. This past May, the Arizona Department of Transportation and the Federal Highway Administration conducted the second round of public outreach activities for the Interstate 11 environmental study. A total of six public meetings and four agency meetings were held to provide an update to those interested in the study and to gather their input. This portion of the public outreach process supports the alternatives analysis for the I-11 Study and assists ADOT and FHWA in determining a reasonable range of alternatives to carry forward into the Draft Tier 1 Environmental Impact Statement for more detailed analysis. The purpose of the May meetings was to solicit input on the universe of alternatives that was developed. This includes alternatives that the study team recommended for elimination and those still under consideration to be advanced into the Draft Tier 1 EIS. The public meetings were held in Tucson, Marana, Nogales, Casa Grande, Wickenburg and Buckeye at schools and community centers. More than 600 people attended the meetings, with more than 2,300 comments gathered through June 2, which marked the end of the 30-day formal comment period. Meeting participants could leave comments on large table maps, on comment forms (written or electronic), at laptop stations, or via a court reporter. For those who could not attend in person, comments could be emailed, mailed or phoned in, as well as submitted via an online mapping and comment tool. All meeting materials are currently posted on the study website under the Community Outreach and Public Meetings tab. Once complete, a summary of all comments received will be posted as part of the Agency and Public Information Meeting Summary Report. Also, upon completion, the study team will post the Alternatives Selection Report, which documents the alternatives analysis process, including how the agency and public feedback received was incorporated into the range of alternatives that will be carried into the Draft Tier 1 EIS for further study. The next round of public involvement is expected to occur during summer 2018, following the release of the Draft Tier 1 EIS. This will include formal public hearings. Check the study website for regular updates from the study team. The concept of a high-capacity transportation facility connecting Canada and Mexico through the western U.S. has been considered for more than 20 years. It was initially identified as the CANAMEX Trade Corridor, which was outlined in the 1991 Intermodal Surface Transportation Efficiency Act, established under the North American Free Trade Agreement in 1993, and defined by Congress in the 1995 National Highway Systems Designation Act. 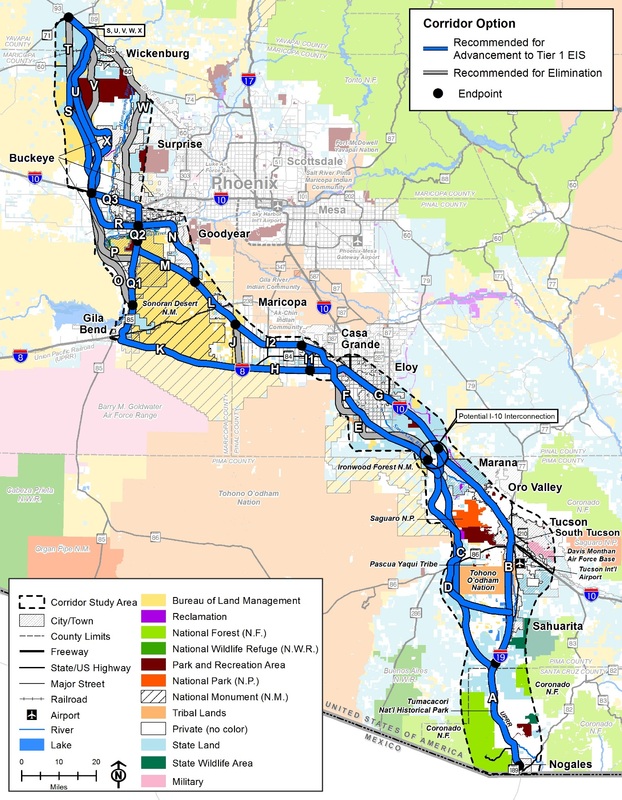 In 2014, the Arizona Department of Transportation and the Nevada Department of Transportation jointly completed the I-11 and Intermountain West Corridor Study, with the purpose of determining whether sufficient justification exists for a new high-capacity, multimodal transportation corridor, and if so, to establish the likely potential routes. The Federal Highway Administration and the Arizona Department of Transportation continue to study the I-11 Corridor in Arizona through preparation of the I-11 Tier 1 Environmental Impact Statement. An early step in preparing an EIS is to determine if transportation challenges or other needs exist in a defined study area – in this case, within the approximate 280-mile corridor between Nogales and Wickenburg. If the analysis demonstrates a clear Purpose and Need, the study process continues with evaluation of a reasonable range of alternatives to develop a solution that would best meet the Purpose and Need. In addition to these Build Alternatives, a No Build – or do nothing – scenario will be assessed. FHWA and ADOT have prepared a statement of the Purpose and Need for I-11, which is based on key transportation-related issues identified in previous studies, and which have been refined through agency coordination and public involvement during the scoping process (May-July 2016). The Purpose and Need statement is available on the Study Documents page. The Federal Highway Administration and the Arizona Department of Transportation will be preparing a Tier 1 Environmental Impact Statement for the Interstate 11 Corridor from Nogales to Wickenburg in compliance with the National Environmental Policy Act and other regulatory requirements. NEPA was enacted by Congress in December 1969 and signed into law in January 1970. It was the first major environmental law in the United States that established the nation’s environmental policies. Under NEPA, federal lead agencies, such as the FHWA, are required to consider impacts of a proposed action on social, cultural, natural and economic resources. 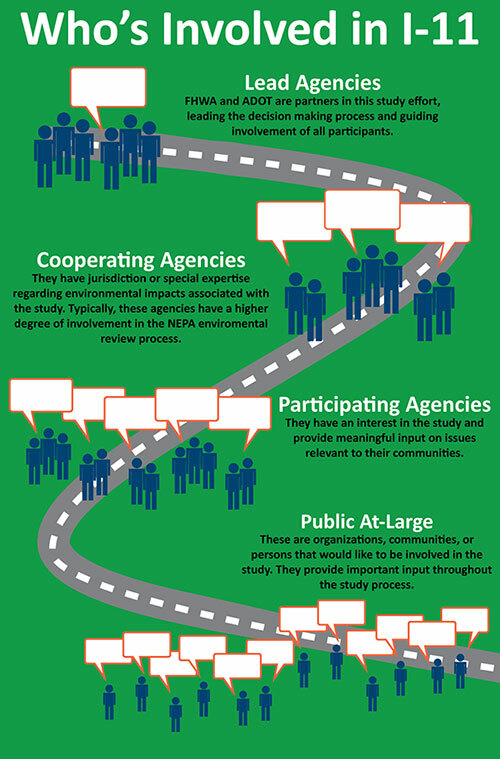 The environmental review process under NEPA also provides an opportunity for you, the public, to be involved in the decision-making. It helps you understand what is being proposed; allows you to offer your thoughts and ideas on alternative ways to accomplish what is being proposed; and seeks your comments on the potential environmental effects and possible mitigation required for the proposed action. Community members have valuable information about places and resources that they value and the potential effects that proposed actions might have on those places and resources. NEPA provides you with multiple opportunities to work with the FHWA and ADOT so they can take your information and feedback into account. 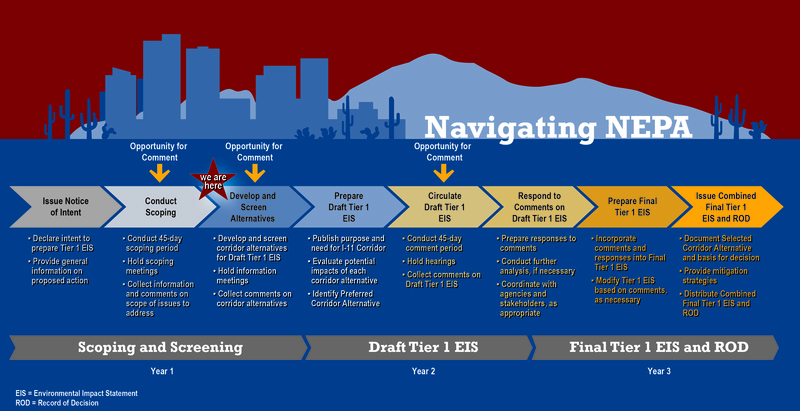 The graphic below shows the general steps of the environmental review process in preparing the Tier 1 EIS, including the opportunities for public and agency comments. We have completed the second step shown on the graphic (Conduct Scoping) and are now moving into the next step (Develop and Screen Alternatives). Scoping is an early, important step in the environmental review process. During scoping, the public and agencies have an opportunity to share their ideas and concerns, which help determine the “scope” or range of issues to be addressed in the environmental document, also referred to as the Tier 1 Environmental Impact Statement. The Federal Highway Administration and Arizona Department of Transportation held six public scoping meetings between June 8th and June 29th at locations throughout the corridor study area, including Casa Grande, Buckeye, Nogales, Tucson, Marana, and Wickenburg. A total of 540 people participated in the meetings. 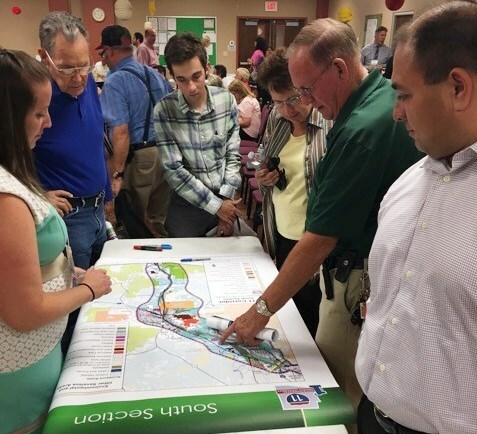 Attendees were encouraged to share verbal and written comments, as well as mark suggestions on maps of the 280-mile-long corridor study area. In addition to the scoping meetings, the public had an opportunity to submit comments through an online survey and by e-mail, mail or voicemail. In total, 834 public comments were received through these outreach methods. Three agency scoping meetings were also held to obtain input from federal, state, regional, county, local and tribal governments. The meetings were held in Phoenix, Casa Grande and Tucson, with 23 agencies in attendance. Members of the public who completed a comment form or online survey were asked to rank potential issues and human and environmental factors from 1 to 5, with 1 being the most important and 5 being the least important. The graphic to the right summarizes the ranking results from the 657 people who completed a comment form or online survey. For the complete list of questions asked of study participants during scoping, please see comment form. Other written and verbal comments were received about environmental concerns, potential corridor alternatives, multimodal considerations, economic development, and other issues. The full Scoping Summary Report will be posted on the study website in the coming months. Check the i11study.com website for regular updates from the study team. 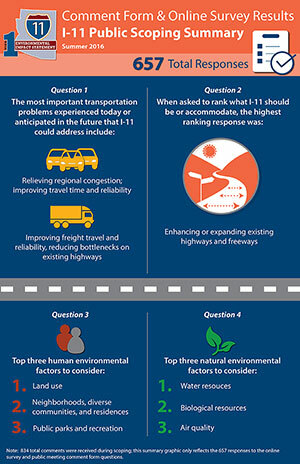 The feedback received during the scoping process will help the FHWA and ADOT identify the purpose and need; potential corridor alternatives to be studied; impacts to be evaluated; and evaluation methods to be used during the development of the I-11 Tier 1 Environmental Impact Statement. This is only the beginning – the public and agencies will continue to be engaged throughout the study. It takes many people, from the planning phase through construction, to take a proposed project like Interstate 11 from an initial concept to a transportation solution. With a three-year environmental study that began recently for a corridor between Nogales and Wickenburg, here’s a quick rundown of who’s involved. The Federal Highway Administration is the federal lead agency and the Arizona Department of Transportation the local study sponsor for the ongoing Tier 1 Environmental Impact Statement required under the National Environmental Policy Act. Together, they lead the environmental review process and guide involvement from others. These include federal agencies with jurisdiction or special expertise regarding environmental impacts. Other agencies or tribal governments may also qualify if the Federal Highway Administration concurs. Cooperating agencies typically have a higher degree of involvement in the environmental review process. Certain federal, state, tribal, regional and local agencies with an interest in the study provide meaningful and specific insights. The role of participating agencies is broader and less-involved than that of cooperating agencies. These partners range from other agencies to organizations to individuals who wish to be involved. These stakeholders tend to have specific interests in the study, such as living or working in the study area. This effort could not be done without their participation and involvement.